The social media rise to prominence over the past decade has been well documented. It comes as no surprise that the sheer power and possibilities, offered by the user-generated media, have enthralled marketing and communication specialists and forced them to search for ways to tap this vast potential. 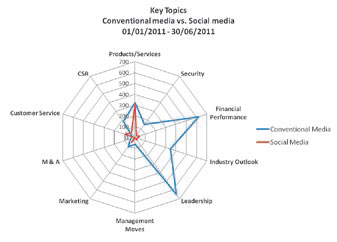 Although social media have turned into a natural fit for consumer brands, leading consulting companies Accenture (Social Banking – Social Network Imperative, August 2011) and KPMG (The Social Banker: Social media lessons from banking insiders, April 2012) have stressed out the financial services sector has been sluggish to embrace social media. Even The New York Times has recently run a special report on this phenomenon (Banks Slow to Embrace Social Media, 26th April 2012). Bulgarian banking industry – making sense of the media buzz, a study by Perceptica Media Research. The world’s banking sector is facing the rather daunting task of catching up when it comes to interacting with its clients in the social media. Few financial institutions have dared to undertake any measures to leverage social media and have done so rather tentatively. Most banks today are still bewildered by and reluctant to use social media. In the meantime, we are witnessing an ever increasing adoption of social media among consumers. Additionally, consumer brands have been flocking to Facebook, Twitter and the likes for a while now and have been shaping the expectations and habits of how people interact with brands in this medium. These expectations and practices are subsequently transferred onto other product-and-service categories with less distinct business-to-consumer profile, like the banking industry. Opportunity to read reviews, complaints, and questions from other customers. Banks can utilise social media as a listening device, a products-and-services development/enhancement tool, and a customer service channel. The social media provide access to unabashed end-user opinions and the marketing managers get a chance to look at the brands through the eyes of their customers. Also, client feedback gathered this way can be cheaper, easier and faster to collect in comparison to traditional customer service and marketing outlets. This can prove vital in keeping the brand relevant. Following this train of thought, the marketing managers can solicit information from the customers with regard to new product development and improvements. The user-generated media is a great source for gaining insights about the most salient issues related to a product or service. Last but not least, banks can utilise various social-media platforms as effective customer service channels. The interaction in this medium can help build stronger rapport with the customers and might prove very cost effective whenever the customers are given the opportunity to read reviews, complaints and questions from other customers. Where do Bulgarian banks stand? The Bulgarian banking industry – making sense of the media buzz analysis we did for SEE Top 100 last year confirmed the observations of our colleagues at Accenture and KPMG. Local banks did not show any serious signs of attempts to engage and utilise social media. On the other hand, the topics that dominated the conversations in the Bulgarian social media suggested the user-generated content carried all the prerequisites to provide the banks’ brand and communication managers with valuable and meaningful insights. With regard to utilising the social media as a customer service channel, in 2011 we saw almost no efforts in this area. A brief look at the leading banking institutions in Bulgaria this year shows that a few of them have taken serious steps to establish their presence in Facebook and Twitter and actively interact with their customers on these social-media platforms. A brief look at the leading banking institutions in Bulgaria this year shows that a few of them have taken serious steps to establish their presence in Facebook and Twitter and actively interact with their customers on these social-media platforms. First of all, the banks’ brand and communication managers need to identify the most relevant social-media platforms in terms of target demographics and content. Not all social-media platforms are the same and that is why they tend to display rather different agendas and dynamics. The next step is setting up a response system. This goes beyond plain customer support desk addressing client complaints and PR crisis management. The marketers need to make sure the data and insights gathered via the social-media listening are disseminated to all interested parties (product development teams for example), not just the communication team. Additionally, all interested parties should have at their disposal proper means to act timely on the information received from the social media intelligence. Following these simple steps is the only proper way for any organisation, not just financial institutions, to establish and benefit from genuine social media engagement.